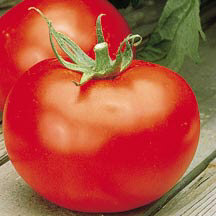 We have the largest section of tomato varieties and pepper varieties in the area. Scroll down to see all of our starter vegetables and vegetable containers. Be sure to check our selection of herbs as well. 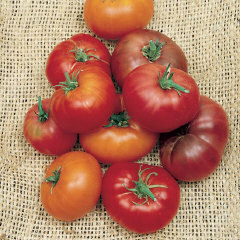 A spectacular, midseason variety with plump, juicy, deep red tomatoes that often weigh more than one pound. Once they arrive they just keep on coming! Fruits are extremely flavorful, with flesh that's juicy, yet firm. Heavy foliage protects fruit from sun-scald. A highly adaptable variety that thrives in nearly any climate. Demonstrates excellent disease resistance. 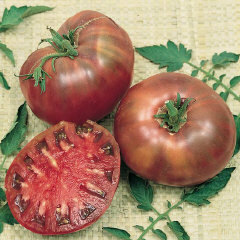 A prolific yielder whose novel, black fruits are well-formed, oval shaped, with "real tomato taste"! A most unusual novelty. 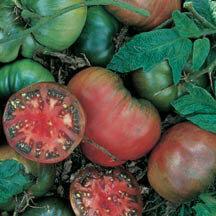 Fruits are a dark, deep red (almost a shiny black) with heavy green shoulders. Interior is a deep, reddish-green color. Sweet and tasty. Matures extremely early. 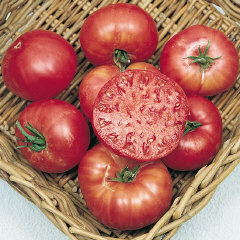 An Amish heirloom that dates back to 1885 and is generally considered to be the world's best-flavored tomato. Plants look like potato vines with good yields of extra-large (up to one and one-half pounds), firm, clear skinned, light rosy-pink fruits. Medium pink-purple fruits that appear brown in color, averaging 8-12 oz each. Fruits are round to oblate, with no cracking. 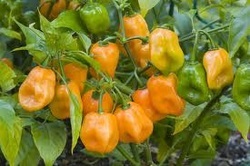 Mild drought tolerance and resistant to common diseases. Highly productive and easy-to-grow, this rewarding variety produces loads of 1-1/2 to 2 ounce, bright scarlet-red fruits clustered in grape-like bunches. Fruits are very sweet at first bite, followed by strong tomato flavor. This well-named giant produces large 12 ounces to 2 pound, firm, meaty, heart shaped fruits with tick walls, few seeds, and a mild flavor. The vigorous vines produce high yields of fruits that mature late but are well worth the wait! Season long production of outstanding fruits, 1" in size and featuring excellent flavor. A member of the Husky "ISI" Series, whose dwarf indeterminate habit and quality production makes it perfect for small spaces and containers. Contains anthocyanin - a naturally occurring pigment that has been shown to fight disease in humans. 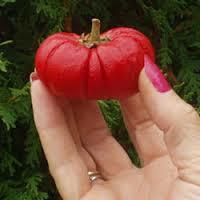 This is the first high anthocyanin tomato commercially available anywhere in the world. 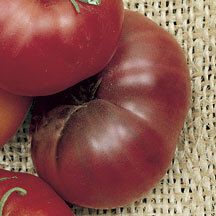 2" round fruits with a superbly balanced, multi-faceted tomato flavor. Allow fruits to mature completely for best flavor. 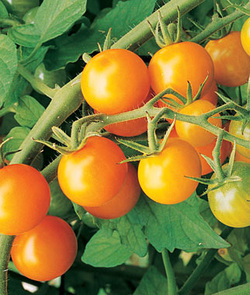 This is one of the most sought after Tomatoes, as it features great taste and large fruits. Excellent slicing tomato with wonderful flavor. Saved by generations of gardeners and reintroduced because of its enduring qualities: vigorous fruit set, round, medium-sized, red globes that weigh 8-1/2 oz and are 2-1/2 to 3" across, with a sweet, mild flavor. Meaty, textured fruits are produced continuously until frost on sturdy plants. 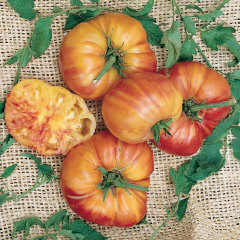 An heirloom originally grown by the Mennonite community of Virginia, and one of the best-ever varieties for slicing. Huge fruits weigh 1-1/2 to 2 lbs each with an unusual boat shape. Perfect for container gardening or limited space. Vines are extremely compact, yet produce medium-sized, deep, oblate, fruits that are smooth, firm, and flavorful. 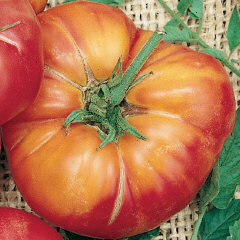 Dating back to 1885, Brandwine is the heirloom tomato standard. 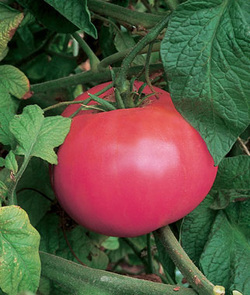 One taste and you'll be enchanted by its superb flavor and luscious shade of red-pink. 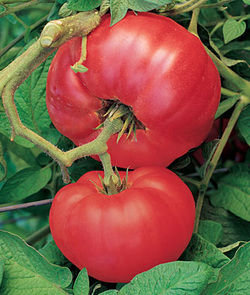 Large, beefsteak-shaped fruits grow on unusually upright, potato-leaved plants. Fruits set one or two per cluster and ripen late - - and are worth the wait. Brandywine's qualities really shine when it develops an incredible fine, sweet flavor. 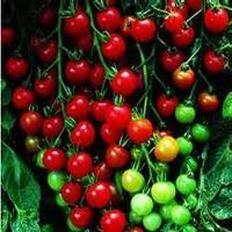 This large indeterminate potato leaf fine tomato plant produces deep-red fruits weighing up to 2 lbs with excellent, mild, balanced heirloom flavor. All purpose variety, ideal for canning. Ripens evenly from inside out. Bright red fruits with heavy walls average about 7 oz. Attractive, old-time favorite. Full-bodied flavor and disease resistant. Vigorous vines produce high yields of 2", yellow-skinned, pear-shaped fruits with few seeds. Slightly later than Red Pear, but with the same prolific yields and dependable performance. The best tasting grape tomato in many taste tests. 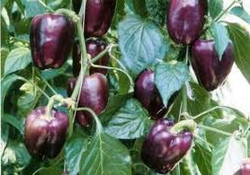 Its indeterminate plant sets heavy yields of 1 inch grape-shaped fruit that have a rich red color. The firm fruit has a pleasing texture. The fruit form in long clusters, which allows for an easy harvest. 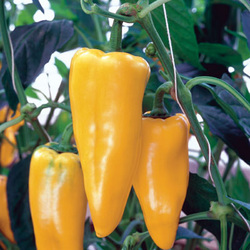 Best yellow variety for short season areas. Bright yellow 4 to 6 ounce fruits are smooth and blemish free. Flesh is meaty, mild, and acid free. 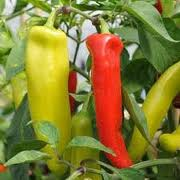 Excellent Fresh for salads, sandwiches, or adds a nice splash of color to salsas. Heavy yielder over a 3 to 4 week period. This heirloom from the Ozark Mountains is excellent in salads or for juices. Its 1/2 to 1" fruits are smooth, mild, glossy red, and range from round to oval in shape. Resists early blight and black rot. Prolific re-seeder. Modern strain of classic Brandywine delivers world famous flavor packed into fruits that weigh up to one pound. 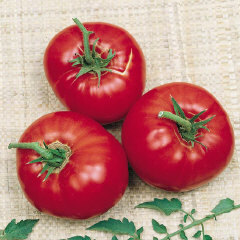 They are firm, juicy, and have an incredible, rich tomato taste. Potato-leaved plants do well under a wide range of conditions. Fruits mature later in northern areas. 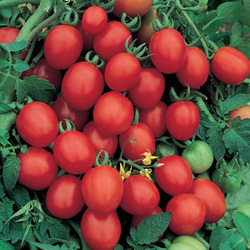 Sweet 100 - A garden favorite that bears 100 or more small, sweet, red tomatoes in clusters on long branches. Space these about 24 - 36 inches apart. Fruit is small 1 inch (approximately grape or cherry size). Plant them in full sun. 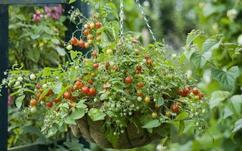 Pick vine ripened tomatoes right from your own basket. These sweet tomatoes are just a tad bit larger than grape or cherry but continue to produce fruit throughout the entire season. 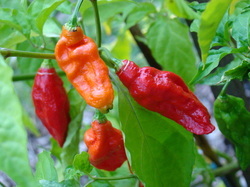 Bhut Jolokia - World's Hottest Pepper. 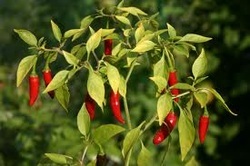 Known in India as the "ghost chili" it is in the Genesis Book of World Records as the world's hottest pepper. Sweet, Mild, Banana shaped pepper. 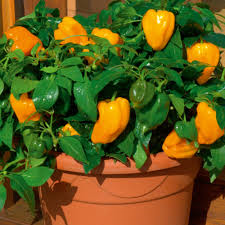 25 - 30 pods per plant. 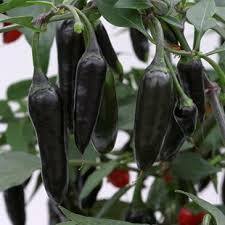 Great for frying, pickling, and is an excellent choice to make pepper rings for sandwiches. 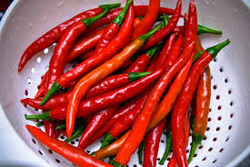 Sweet and HOT cayenne for fresh use. 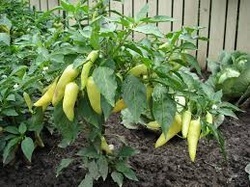 Hot pepper - similar to Jalapeono type. Delicious chocolate, deep brown, blocky fruit. 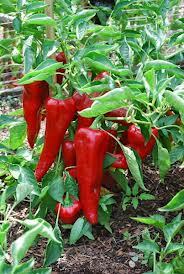 One of the sweetest tasting peppers of its kind, excellent in salad or stuffing. Sweet, juicy, and tasty. Perfect for eating fresh or even right off the plant. MILD and delicious. 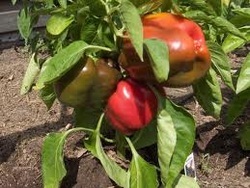 5" x 4" blocky fruit, Sweet, bell shaped pepper. 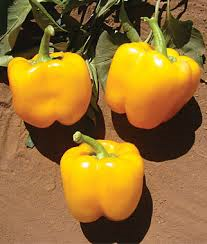 Bell Pepper with a KICK. Medium Hot. 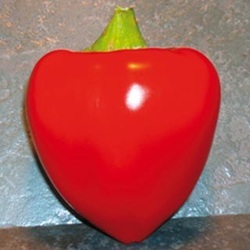 Mild Sweet Bell type pepper. 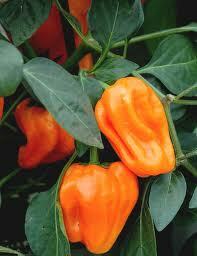 Sweet Orange bell pepper adds color to texture to any dish. 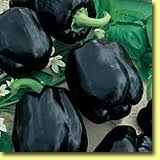 Colorful Purple peppers are always a favorite. 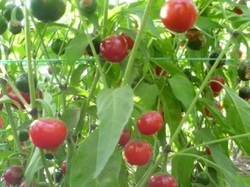 This variety produces loads of beautiful bells on compact, bushy plants. Crisp texture and mild, sweet flavor makes this one popular with everyone. When left to dry, it takes the shape of a mini pumpkin. 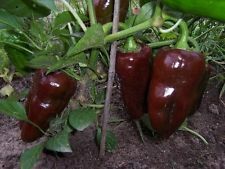 Peppers are bitter and not edible and turn from green to red when mature. If left on the vine they will turn burnt orange. Lovely sweet taste for salads and roasting, especially when partically or fully red-ripe. Tapered fruits average 6" long x 2 1/2" wide, about 5 ounces. Ripen from green to deep carmine red. Sweet, mild, and juicy with a fruity sweet flavor at full maturity. Pretty heart shaped, thick walled fruit. You don't have to have a large garden spot to have fresh from the vine vegetables. 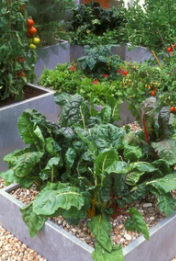 Try container vegetables from English Country Gardens. Container gardening works great for everything from herbs, tomatoes, carrots, beets, even potatoes. At English Country Gardens we have containers already planted for you or select from a variety of our starter packs. Varieties and availability subject to change without notice.